I found a fabric of worthiness, once again in my local parish opportunity shop. Champagne coloured brocade. It cost me $3. Now what am I going to do with it? As seen on peoplestylewatch.com, Ashley Green in a floral-embellished blush Valentino dress. But this is not a dream, it is reality, and reality is; I've only just learnt to sew, I couldn't possibly create a dress. 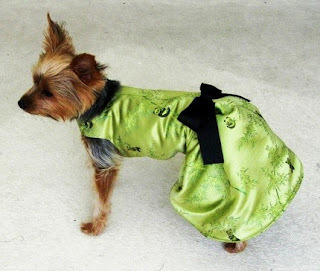 I doubt I would even be able to construct a brocade dog dress as seen on etsy! But what I am enjoying, is a whole new chapter in thrifting; fabric shopping. Now I am creating my own 'stuff' I head straight to the fabric boxes, usually tucked away at the back of the shop, to see what materials lie in waiting. I'm still not sure what I will do with my brocade yet, but for now, it hides away in my pile of increasing pretty thrifted fabrics, and in the back of my imagination for a creative future garment.